Elegant Magic for your event! Marco's magic for any event: birthdays, weddings, celebrations, parties. Classy magic in the East of England. 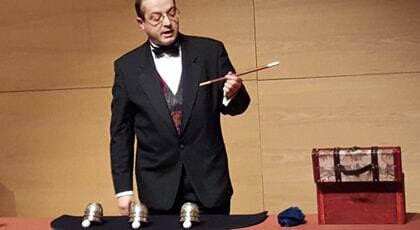 Magic up close is Marco's speciality: you will see what more than 30 years of practice can teach to a skilled pair of hands. Discover the amazing magical stories by Marco, where reality mixes with fantasy and magic of times gone by becomes alive in your home. A magician for your party! Welcome to MPMagic.co.uk, a company aiming to provide high quality magical performances in the East of England. Planning a function? Having a party? Want to entertain a number of guests? Planning the launch of a new product? Looking for an entertainer for a birthday party? Do you need a magician for your wedding? MPMagic can be the organization which makes all the difference. We pride ourselves in the ability to satisfy our customers and to provide the best possible show for every kind of event. For this reason, we would like to discuss your requests with you, to provide you with the best possible alternatives. Feel free to call or email us, without any commitment, and we will be only pleased to help. 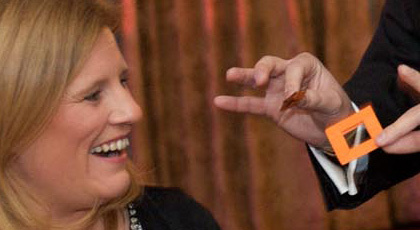 Our Magicians and Storytellers can provide a classy and different form of entertainment for any sort of function. Please, feel free to browse the site and contact us with specific requests with no obligation whatsoever. Also note that the "Shop" area contains a selection of exclusive material for professional magicians. While we perform mostly in the East Anglia region (counties of Cambridgeshire, Suffolk, Essex, Norfolk), being located in the central hub of Bury St. Edmunds, we can travel all around England with our shows. If your show is not in the Eastern region, please call us anyway, as we may be able to help to make your event a success.